Contemporary with the Lockheed XFV-1, the Convair XFY-1 was designed for the same US Navy competition. This was intended to investigate the potential of a small single-seat tail-sitting VTOL fighter aircraft for operation from and to small platforms on a variety of ships. The fuselage served to accommodate the pilot's cockpit and turboprop power-plant, and mounted externally the monoplane wings of modified delta planform and large dorsal and ventral tail surfaces in a cruciform arrangement. On the ground the XFY-1 rested on small castor-ing wheels at the tips of the horizontal and vertical surfaces. Extensive tethered tests from a special rig were followed by a first vertical take-off and landing on 1 August 1954. Testing continued with a series of similar vertical flights before the first complete transition from vertical to horizontal flight and vice versa was accomplished on 2 November 1954. Although some 40 flight hours were accumulated by two prototypes of this experimental fighter, its development was abandoned as a result of major flight control problems. This is one of my all time favorite aircraft. I think it was unfortunate that it never served. Unlike the Lockheed Salmon; the Pogo can only land and take off vertically. Yes; it can fly horizontally; but can't land and take off horizontally. It was exciting to live in an era when these aircraft were new and the United States had an educated, literate population able to spend on uncertain projects and willing to experiment with original ideas. The XFY-1 and XFV-1 made the cover of Collier's magazine and were well known to every teenaged aviation enthusiast in the 1950s. the two propellor hubs rotated around a central "stalk" that extended from the fuselage. A radar wouldn't have been a problem. This was an extremely ill-conceived and impractical idea on the part of the Navy, probably thought up by someone who had never actually been on a ship at sea. For one thing the designated engine, the Allison T-40, was mechanically unreliable. Apart from that, however, the possibility of a regular military pilot being able to take off and land in a vertical attitude successfully from a small platform on the rolling and pitching deck of a ship at sea was extremely remote. As it was this prototype aircraft only managed to be taken off and landed from the land, and then only by an extremely experienced test-pilot. Robert Lee (Hoot) Gibson, retired NASA astronaut is currently building a scale rendition of the Convair XFY-1 POGO as a radio controlled model aircraft. Looks like it will use a contra-rotating prop too. The 18 ft. Diameter contra-rotating propellers were provided by Curtiss Wright. I had the priviledge of being the Curtiss engineering rep for a short time in early 1954 and worked with Skeets. Oh yes it was a dangerous machine and anyone who flew it had to be a courageous and talented pilot as were those that flew the Sea Dart where one lost his life in a terrible accident on the bay. The statement that only one pilot flew the XFY-1 is incorrect. I was the alternate pilot to Skeets Coleman, & I hovered it in free flight off Lindberg Field without rig training--almost wrecking it in the process. Randino is correct in stating that a fixed shaft came through the contra-rotating propellers--it was used in the rigs that were used @ Moffet & Brown Field for tethered training. 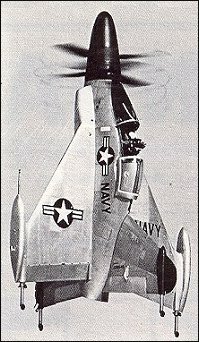 "The spinner was so large because the production version was intended to carry an air-intercept radar, although no mechanism was devised to stop it rotating with the spinner" is incorrect. The forward section of the nose was static (originally designed to have a parachute recovery housed in what would be the upper section for test); the two propellor hubs rotated around a central "stalk" that extended from the fuselage. A radar wouldn't have been a problem. It's a shame it never served. � The Convair XFY-1 Pogo was designed to take-off and land vertically. Only one pilot was brave enough ever to fly the dangerous machine. � The spinner was so large because the production version was intended to carry an air-intercept radar, although no mechanism was devised to stop it rotating with the spinner. 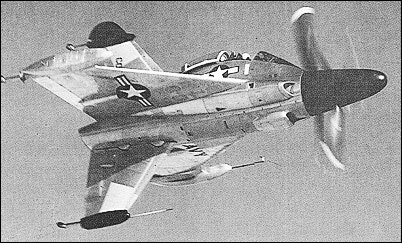 � Although the XFY-1 was never armed, a producrion Pogo would have had four 20mm cannon or a battery of air-to-air rockets. � To board the Pogo, the pilot had to climb a very tall ladder and lie on his back while the aircraft sat on its tail. Special moveable hangars were needed so that groundcrews could work on the engines. � Castoring wheels were fitted to the ends of the wings and tail surfaces.